In the today’s boardroom, the focus is on the communication that occurs there. 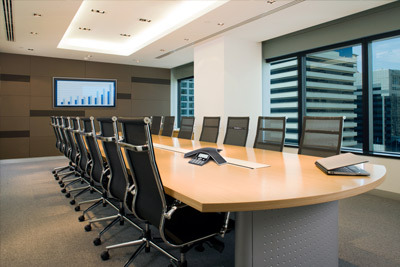 Boardroom communication systems from All Safe enhance your meetings and professionalize every meeting you have there. Audio and video conferencing saves significant travel budget while increasing the connection with businesses around the world. Let All Safe put you in control of your boardroom by ensuring all your systems operate flawlessly and at the touch of a button: HVAC, lighting, audio / video networking and even the shades. Sophisticated audio video systems enable effective meetings with people anywhere, What’s most remarkable about these wondrous technologies is that the All Safe technical team can in stall them so their operate simply at the push of a button. It’s time to take charge of your high tech boardroom systems and enable it to operate at its full potential!